So, my aim was to do one a week, before the release of the 3DS next week, but that obviously didn’t happen. But, here’s a great game that you really should get for your DS (and is compatible with the new 3DS). 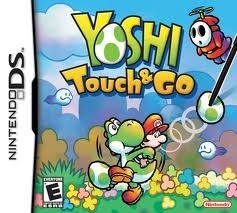 Yoshi Touch and Go was a launch title when the original DS launched, making it almost 7 years old. When it was first launched, many pigeon-holed it as a glorified tech demo, and feature-wise, they weren’t entirely incorrect. However, that doesn’t mean there isn’t still tons of fun to be had from this title. The game has you playing as Baby Mario on Yoshi. What’s different here from Yoshi’s Island and Super Mario World is that you do not directly control a character. Yoshi moves without you controlling him. You are in charge of controlling the environment. You need to destroy enemies with the stylus, collect apples, stars, and more. The game plays like an old-school 80’s game, in that if you lose, you go right back to the beginning. You are playing for a high score, not leveling. As you reach certain check points in your score, you unlock other modes. My favorite has you in charge of drawing safe slides and chutes for Yoshi to land on as he falls from the sky. As he’s falling, enemies try to attack him, so you are also tasked with drawing circles around them so that they can’t attack Yoshi. Now, looking at how simple the gameplay is, and where we currently are in an age of $.99 games, it may seem like a steep price to pay for Yoshi Touch & Go (you can find it on Amazon for about $5-10); however, what you are getting here that no app developer can give you is a Nintendo experience from Nintendo. That may sound like company pandering, but if you’ve played Nintendo games for as long as I have, and you’ve played all the great iOS games, you know that there is no comparison.